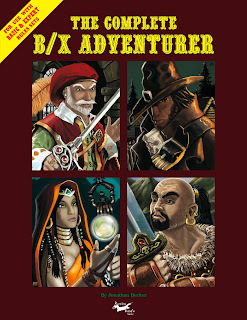 The Complete B/X Adventurer is the latest publication by Jonathan Becker of the B/X Blackrazor blog. It's a 62-page softcover book focusing on a variety of new rules and rules options for characters in "fantasy role-playing games of the sort that use 'class' and 'level' to define [them]." Like its predecessor, the B/X Companion, The Complete B/X Adventurer is not written with any specific retro-clone in mind (even though it's probably most directly compatible with Labyrinth Lord). In fact, this supplement doesn't even use the OGL at all, which, while defensible, ensures that no other publisher will be able to make use of its contents. I bring this up mostly because I think there's a lot of good stuff here and it's a pity that some of it likely won't get used more widely. Physically, the book is a sturdy perfect-bound volume, with color cover art by Brian DeClercq, depicting four of the seventeen new classes presented herein. Interior artwork is by Josh Boelter, Kelvin Green, Matthew Shultz, and Kayce Sizer, all of it quite good, with Green's being the stand-out in my opinion. The book uses a two-column layout and the text is clear and readable. Currently, it's only available in printed form for $28.99 for US/Canada and $37.99 for the rest of the world (the price includes postage). The book begins oddly, with a section entitled "100 Fine Reasons & Fantastic B/X Headgear." The 100 Fine Reasons in question are tied to a percentile table offering justifications for characters to be traveling together. It's intended as a quick and simple way to explain why a party of adventurers has come together. The section on headgear is a collection of random tables intended to describe what a character, be he a PC or NPC, is wearing on his head. Neither of these sections is badly done or without value. Together, they take up three pages of the book. Still, they seem out of place, particularly given the bulk of the book's contents. Less odd is another three-page section entitled "Exceptional Traits," which offers four D12 tables for each broad character archetype (cleric, fighter, magic-user, thief). Each entry on the table indicates something that's special about the given character. For example, a cleric might be an "apostate," which grants him the ability to cast reversed spells freely without penalty, while a magic-user might have a "mystic aura" that grants him a +2 bonus to reaction rolls. These exceptional traits all grant minor mechanical benefits, as well as helping to distinguish the character from others of the same class. It's a clever concept elegantly presented and I like it a lot. The next three-page section offers up rules for "Firearms in a Fantasy World," specifically black powder weapons. As presented here, firearms have almost as many drawbacks as they have advantages, making the decision whether or not to use them a significant one, which I like. However, unless my aging eyes deceive me, there is no indication of how much damage each type of firearm does under these rules. There are lots of asides about range, rifling, misfires, use in sieges and the like, but nothing on damage -- again, unless I am missing something. Of these seventeen, most are human-only (all but centaur, gnome, ogre-kin) and four are spellcasters with their own unique lists of spells (gnome, mystic, summoner, witch). Several other classes use spells from either the traditional cleric or magic-user lists. Slightly less than half of the book (pages 32-61) consists of new spells. The new classes and spells are a mixed bag, though I suspect I'm a lot more prone to dislike new classes than many gamers. For me, a class clearly needs to fill a role that no existing class does, so, on that basis, a class like the archer is going to be a hard cell, no matter how well done. That said, what I really like about the new classes presented here is that their associated rules are simple and straightforward. And, even if I don't like the class itself, I can pillage ideas from them for use in other contexts. The same is true of the new spells. In the end, I suspect one's reaction to The Complete B/X Adventurer will depend greatly on how many options one likes in one's games. For many players, the more available classes, the better; for others, that way lies madness. The same principle applies to new spells. If, like a lot of old schoolers these days, your tastes abhor the baroqueness that afflicted late AD&D (or even BECMI), you may find a lot less to like here. On the other hand, if there's no such thing as "too many" options, especially when it comes to player characters, The Complete B/X Adventurer is probably right up your alley. Get This If: You play an old school class-and-level RPG and are looking for more character-related options. Don't Get This If: You are happy with the range of character options available in your class-and-level RPG. I am on the fence for this one. Hopefully a pdf option becomes available because I can't really justify spending $30 on a product that there is a good chance I will never use. Would love to hear from others who have purchased this. B/X Companion is one of my favorite OSR books; it actually made B/X a complete game for me. WIth this new book, however, I may way and hope for a PDF. I generally love new spells (Too many clerics and wizards look like cookie cutters with just the standard lists), new classes, less so. (Partly because I'm just not fond of class and level in any case, so getting more provokes a "meh" reaction in me.) But I'd still like to have a look at them. I'm pretty on the fence with this one, too. While I like the idea of players having more options, I'd rather have them come from player suggestions or the campaign's setting than just adding in more classes for its own sake. Definitely some Bard Games Compleat Adventurer/Arcanum influence on those new classes. Thanks for reminding me of this one! I just ordered my copy. BTW, I think the lack of damage for firearms ties into the author's penchant for non-variable damage (1d6). Thanks for the review, James...and for the business as well! "If using the optional Variable Weapon Damage rule, all weapons listed here do 1D8 damage." As for the extra spells: rather than simply a bloat of options (which I, too abhor) my objective was to show some different STYLES of magic...each spell-caster's "magic" operates differently from each other and from the standard magic-user and cleric magic rules (what is later coined as "arcane" and "divine" schools) that have become so staid over the years. The summoner's pacts, the witch's circles (and components), the tattoo mage's body art...all acquire spells differently and have a different PLAY style from the "same-old, same-old." At least, that was what I was trying to hit...and in the end, much of the book IS indeed about inspiring people to come up with their own ideas. My grand hope is that people will steal the ideas and information found in the book. I promise, I won't sue anyone who decides to use the ideas in the book. Brandon, I own Jonathan's book, and so perhaps can give some feedback. I agree with everyone's comments so far on their approach to old-school gaming. I prefer the less-is-more approach; I don't want my game to have tons of required rules, classes, etc. However, I do appreciate having at hand a large array of options from which to select in order to construct my "ideal" game (what Jonathan calls "D&D mine"). Jonathan's book gives me a number of excellent options to incorporate into my ideal game as I see fit. Some things I find to be quite helpful; others not so much. As James pointed out, the meat of the book is the new classes. What I appreciate about them is the approach Jonathan took (or tried to take) in creating them. Like many in the OSR, I believe that many of the "new" classes in other versions of D&D can be subsumed under the original four classes. Who needs a knight, when the fighter can easily be played as such? But what Jonathan has done is present a number of different classes where the mechanics are different from the original archetypes. So, the Summoner or the Tatoo Mage have completely different mechanics than the standard Mage; it would not be possible to play a Mage in a way that matches the dynamics of those two classes. That's not so much the case with, say, the Archer. While Jonathan's Archer class does indeed have a different mechanic from the standard Fighter class, you can easily adapt the standard Fighter to be an archer with standard Fighter mechanics. So, while I personally like Jonathan's Archer (and Scout) classes, they provide somewhat less utility than some of the other classes. Still, as I said earlier, I like options, and, in my opinion, the lion's share of Jonathan's new classes are worthy additions, even if just to be stimulated in thinking about how to adapt the four archetypes in new and creative ways. The big question is whether the book is worth $30 for its utility. Well, that's hard to answer. Until you see and study the classes, you won't really know if they are worth $30 to you. I can definitively say that they'll be worthwhile to *some* old-schoolers, but to whether *you'll* find them useful, only you can say. I happily paid the $30, rather than waiting for the PDF (that I still want! ), because I want to support the efforts of guys like Jonathan (the same reason I purchased James' Thousand Suns). I love our hobby, especially in its Old-School incarnation, and supporting the efforts of independent operators like Jonathan, James and Dan Proctor is worth it to me. But not everyone can throw money around (neither can I, actually), so, as they say, your mileage might vary. Thanks for responding directly. I have a shelf of OSR material (including the B/X Companion) as I try to support as best I can. That's not even counting all the pdf's I have purchased and orders and Kickstarters still on the way. My problem is I haven't even read half of this stuff yet (let alone use any of it) and I am starting to realize I need to be a bit more selective as to what I buy. This definitely sounds like something I could use as inspiration but I wouldn't use as is. Guess I will just wait for the pdf then. That way I can still support this work and if I never get around to reading it I won't feel so guilty lol. Thanks for the lengthy reponse!